Inspired by early-morning courses during my undergraduate years, I originally conceived 9am Class as being a game about staying awake. Starting with the fiction, I wanted players to be students in a classroom, struggling to stay awake for fear of getting kicked out of class by the professor. Students could sleep as long as the professor didn't notice, but if a student were called on, that student would get the boot. 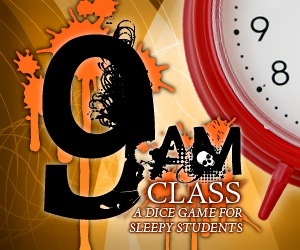 I imagined 9am Class would make a great little dice game, where players could roll to determine their status. The first element I designed was the sleep system. Looking at the six faces of a die, I took 1, 2 and 3 to represent a sleeping student, as their faces were either a small dot or a line (similar to a closed eye). 4, 5 and 6 represented an awake student, due to the circular formation of the dots on those faces (similar to an open eye). Earlier, I had players rolling at the beginning of the game to determine their status, and having their die slowly count down to 1 (symbolizing players slowly falling asleep), and then resetting back to 6 (as though a player suddenly jolted awake). The problem here was determining when the professor called on a student. An easy solution was having a separate die be the professor, who would roll to call on students. I decided to keep the concept of the professor die and assign numbered "seats" to each of the six players. The seat a player was in determined that player's assigned number. When the professor rolled that number, it meant he called on that player. This also gave the game the visual look of a classroom. The six "desks" were positioned in a horizontal line in front of the professor, with each player's die played on his/her desk. From this visual look, I determined that the game should be played in rounds. If a player were called on while asleep, instead of being ejected from the class, his "grade" would go down. The goal of the game then became to have the highest grade by the end of class. 9am Class went through a lot of iterations, and I believe this worked to its advantage. The final game is polished, if a bit simplistic, in its execution. The fiction - though cute and effective - places too many distinct roles on the dice. The game has also never been heavily strategic, largely based on a simple "luck of the roll." I added several decision-making elements to introduce more strategy (like making other students look bad and taking bathroom breaks), but on the whole the game appears at face value to rely on little more than luck. I was able to solve this problem, however, with the next dice game I designed, which became Magic Numbers.